i guess i brought all these clouds down with me! it was not lovely cool in eureka – it was hot and very very humid! everyone kept saying how atypical it was for them, never seen it before, etc. didn’t make it much easier to deal with during setup. and the building was not airconditioned. at least there was still a breeze – but it was still sooooo sticky! also, was able to stay right there – how nice not to have to unhook and drive each day!! and there were no races saturday night! yea! i was at the far end – away from the gate and the busy street and looking at the horses cause no one parked on that side of me. in fact, i had a space between me and the next rig the whole time – just different rigs. and lots of walking space for sophie. it took me about 6 1/2 hrs to get up there, and then 4 hrs to set up, and then a short break before the evening deal from 7-9. needless to say i was dog tired that night. i took my time on the way back and just enjoyed the redwoods on hwy 101. it’s a nice drive until you get to willets, then less interesting until clearlake area. once you turn onto hwy 20 and head toward i-5 – mostly lots of brown hills and winding road for about 80 miles. then onto i-5 and just flat till sacramento. i hadn’t timed it the best, so was concerned. one of the last times i made that trip down i-5 and got to the airport just at 4 p.m. i ran into a major traffic jam that turned a 45 min drive into over 2 hrs! my heart sunk as it looked like it was happening again, but it turned out to be an accident and once past that, it was fine. was really glad not coming the other way! both i-5 and hwy 50 were totally jammed. i passed one accident on 50, farther away (east of) from sac. at that point my side looked nearly empty! i was wondering if something had happened back the other way that was preventing folks from getting thru sac – i mean, it was nearly totally clear! more like middle of the night – never at 5 p.m.!! lucky for me, tho! had to take all the product tubs out of the rv to bring home – have a lot of cutting to do again. this time i must prepare for 2 shows at once – as i won’t come home between newport and florence (oregon). i also have to start planning for piqf and houston – so need to cut the full set of 8 each time and stash the extras. the way time is flying by, it will be mid october before i turn around again! 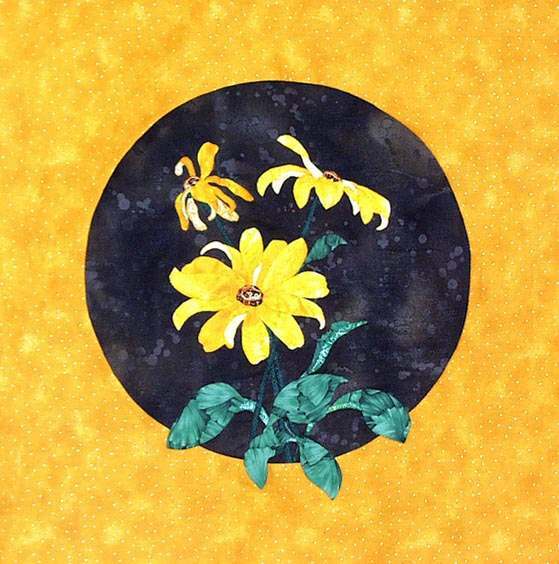 just got the overlay fabric for the black eyed susan – or thought. not the right color! dang. it’s a darker gold/brown than what i used for the sample. i kind of like it – it matches the (flower)center fabric exactly. i am thinking i may use it anyway – which would mean removing the overlay that’s on the sample now – which means at least partially removing and resewing a couple of leaves that spill over into the overlay. otherwise, need to figure out what to do with this bolt – and pay for the other one – plus shipping, etc etc etc. neither option is all that appealing. 😦 choose the lesser of two evils, as they say! i’ll stick a copy of that picture in here (again), so you can see what i’m talking about. hmmm, looks like 4 leaves over the edge. rats. still, i just might even like it better – not so bright. ? ?